Since andLinux Beta 1, the Windows Installer will configure andLinux automatically. Most questions you'll be asked are self-explanatory, so only the most important things are mentioned here. 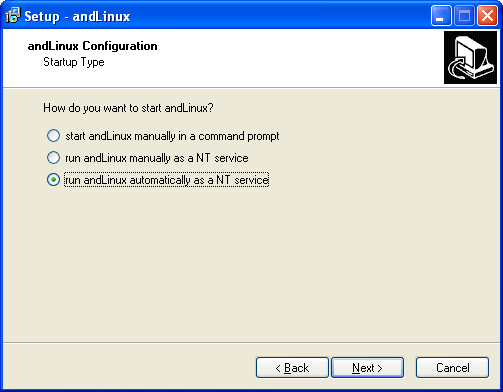 You have the option to run andLinux in a command window or as a NT service in the background; in case you choose the command window option, you'll have to start it via a shortcut; in case you choose the NT service option, you can start the service manually via the Windows control panel, or you can have it automatically started together with Windows which is the most convenient option. In the minimalistic / XFCE version of andLinux, you can choose between the XFCE Panel and the andLinux Launcher to start your applications, in case you start andLinux manually; in case you have andLinux automatically started, you can only use the andLinux Launcher. 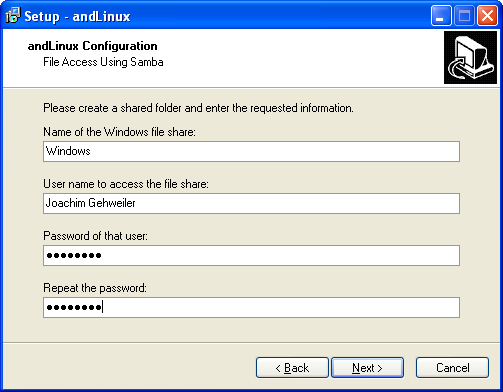 There are two ways how to access the files on Windows using andLinux: the coLinux File System (CoFS) and Windows file shares (Samba). The configuration of CoFS is self-explanatory. Setting up Samba is a bit more difficult, but it's also working with special characters in file names, so you may want to choose this option. Finally, you may receive a Continue Anyway prompt because the WinTap driver isn't Microsoft certified. You'll need to click this. To start andLinux (in case you didn't choose automatic startup during the setup), use the "Start andLinux" shortcut from the start menu (or desktop or quicklaunch icons if created during setup). In case you chose to run andLinux in a command window, andLinux will run in a minimized window labeled "andServer (coLinux)"; do not close this window! If you chose to run andLinux automatically as a NT service, you'll find srvstart.bat in the installation folder -- just in case you may need to restart it manually. Once andLinux is completely running, you may start applications using the XFCE Panel resp. the andLinux Launcher. Note that the first startup of an application may take some time because some applications perform configuration tasks at the first startup.